Halloween overload! Yeeeeaaaah!! There are a lot of things I look forward to (beauty-wise) every year, like Philosophy's seasonal scents, Holiday lip gloss gift sets, OPI's winter collection, and especially Bath and Body Works fall/Halloweeen/winter. 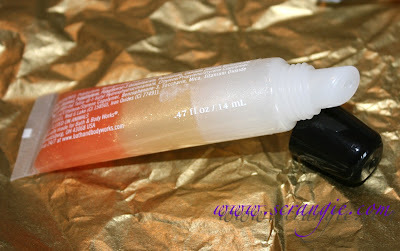 I grabbed most of the Bath and Body Works Halloween Liplicious glosses right when they came out and paid full price... Figures, now they're on clearance for $2! Oh well. I love them. I guess I don't mind paying full price for something I really love. This year, I chose: Cookies and Scream, Vampire Vixen and Crazy for Candy Corn. I also got one of the color changing ones, Wicked Witch's Kiss, but somehow I lost it already... Boo. If you've never used a Bath and Body Works Liplicious gloss before, they come in the standard squeeze tube with slanted tip applicator. Left to right: Cookies and Scream, Vampire Vixen and Crazy for Candy Corn. Aren't they pretty? Especially Cookies and Scream, look at all that glimmering gold and silver! Liplicious glosses tend to be on the thick side, but not terribly sticky. They're a lot thinner in texture than something like Lancome Juicy Tubes. They're really very nice. They don't wear very long, but they're quite good while they last. Cookies and Scream is my favorite of the bunch. I'm obsessed with anything Cookies and Cream scented/flavored, so any time I see a new product in that scent, I automatically need it. This is no disappointment; it's great. The cookies in this one are more chocolate chip than oreo, but that's okay, it's still fantastic. Crazy for Candy Corn is also great. It has a sweet, caramel-like scent that's somewhat similar to actual candy corn, but it's more baked smelling like cupcakes or pancakes and not as overtly sweet and syrupy. Vampire Vixen has a sweet, fruity black cherry scent. It's not artificial smelling, which was a big surprise. It smells like jam. It's not sickeningly sweet like a lot of cherry scents. It even has a little tartness to it. Really, just like cherry or strawberry preserves. The only reason I didn't get the rest of the Halloween scents is because they're all fruity. I don't mind fruity, but it's not really my thing. I usually go for the more vanilla/baked/frosting type of scents, so Candy Corn and Cookies and Scream were perfect for me. The color of Vampire Vixen was too pretty to resist and I'm really happy with it. The packaging on all them is adorable. Also, the 'O's in Cookies and Scream have little skulls in them. TOO PERFECT. I've been wearing Vampy Viven almost everyday since I got it. I need to go back and buy at least two backups. Especially now that they are $2. Crazy or Candy Corn sounds like it's right up my alley because whenever I hear "cupcake" and "caramel" as a scent description, I'm so there! Thanks for swatching them, Scrangie! These sound and look delicious. Yum! These look fantastic!! I love Halloween stuff! I'm the same as you as well! I love baked type scents. I don't mind fruity either, but anything vanilla, coconut or candy flavoured... NOM. Oooh...thanks for telling me about these. I love sweet scented caramel/chocolate/vanilla fragrances too. Not so much fruits. Like minty as well. I'll look for these, especially if they are on sale!